After many meetings, negotiations, discussions and thousands of hours of planning, the Farm Centre and MacDonald-Stewart Hall officially opened on November 18, 1975. Excited to get things going, 4H member Edwin Jewell was centre-stage for the sod turning on January 4, 1975. 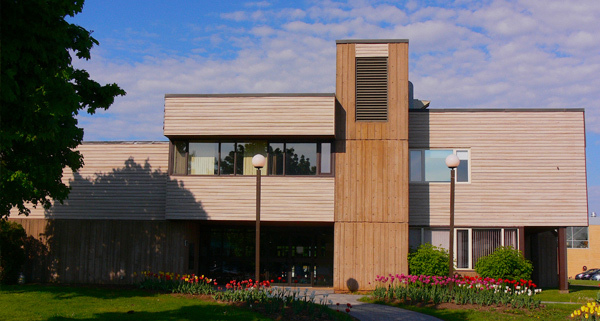 Ten months later on November 18, 1975 the Farm Centre David M. Stewart, President and Chairman of the MacDonal-Stewart Foundation unveiled the commemorative plaque and cut the ribben thus opening the Farm Centre's doors to the community. Present to mark the occasion with opening remarks were Chairman Dan MacPherson, Co-chair Dr. L.B. MacLeod and dignitaries which included The Honourable Gordon Bennett, Lieutenant Governor of Prince Edward Island, Primier and Minister of Justice The Honourable Alexander B. Campbell and the Honourable A.E Ings, Minister of Agriculture and Forestry of PEI. The need for a Farm Centre arose from a growing recognition of the value of commodity marketing boards in providing a more efficient and cohesive means of promoting sales and building cooperation between the agricultural entities that represented farmers and agri-producers and the need for a place for commodity boards to meet an share information in a central location that was familiar with growers, producers and buyers. The need for a convenient building in central PEI with adequate parking also figured into a growing recognition of the need to work together and build a Farm Centre to house the organizations vital to Prince Edward Island's most important industry. One substantial roadblock stood in the way of any proposal to build a Farm Centre big enough to house all of the producer groups - financing the project was going to be an uphill battle. A committee made up of a few men and a farmer's wife approached Dr. Lloyd MacLeod who was suggested using land within the boundary of the Canada Research Station on University Avenue. His enthusiasm for the idea led to the formation of the Farm Centre Association Inc.
Directors in the Farm Centre were drawn from the commodity marketing boards and a member of the Federation of Agriculture. The original commodity boards were the Milk Market Sharing Quota Board of PEI, Hog Commodity Marketing Board, the PEI Egg Commodity Marketing Board, PEI Vegetable Marketing Boarrd, Tobacco Marketing Board, and the PEI Potato Marketing Board. Through the Provincial government $200,000 was procured from a Federal Government "winter works program". The Howard-Webster Foundation pledged $50,000. Due to hardships within the potato and beef industries the initial fundraising campaign was less than spectacular but with a generous donation in excess of $500,000 from the Macdonald-Stewart Foundation plans building began in earnest. Teams were formed to raise cash in various districts with farmers and the commercial firms they did business with kicking in funding. Origianlly the Northunberland Construction was contracted to build the Foundation and walls but setbacks occurred due to a severe winter in 1974. Construction of the foundations and walls got underway a year later than planned. General contractors, Schurman Construction, were contracted to start work in April of 1975, subcontractors Douglas Brothers and Jones undertook the building of mechanical pre-built structures and Burke Electric was also hired. Plans to make sure the Farm Centre included youth were put into effect and a 2400 square foot space named Macdonald Stewart Hall complete with retractable walls and a kitchen was built to accommodate 4-H activities as well as cultural and entertainment events as well as board meetings, seminars, conferences etc. In 2014 the farm centre built the Legacy Garden, the largest urban farm in Canada. The Garden consists of 120 community gardens and a good will garden from which the food is donated to various local charities. There are also various them gardens and outdoor entertainment spaces.